Leveraging on the skills of our professionals, we are involved in offering best quality of Embroidered Tussar Silk Saree. This Tussar Embroidered Silk Saree is provided by us to customers at pocket friendly rates. Further, the offered Tussar Embroidered Silk Saree is appreciated for its elegant embroidery. Following the quality parameters, we are engaged in offering comprehensive range of Embroidery Silk Saree to our clients. We offer a product to our patrons in various color combinations. The offered Embroidery Silk Saree is printed by our professionals from quality colors. Moreover, our product is comfortable to wear. About the Saree: Hand Embroidered pure Tussar silk Kantha Saree in cream & Pink with a intricately embroidered Pallu. Saree comes with blouse shown in Picture 4. We are engaged in providing a vast range of zari embroidered sarees. Using a combination of zari and thread work, we produce alluring and splendid sarees. We offer intricately designed silk embroidery sarees that is made of high quality raw materials. The multi colored embroidery and enticing side work helps in enhancing the aesthetic look of these silk embroidery sarees. Further the exclusive combination of vibrant colors gives these silk embroidery sarees, a enticing look and increases it's popularity among our clients. 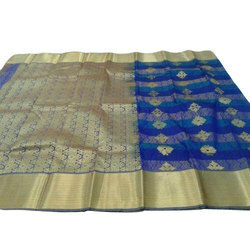 We have attained a notable position in the market by offering the finest quality array of Kora silk Saree.